Vehicle access is limited to snowmobile or ATV once creeks and water ways have frozen. Looking for remote wilderness camping, abundant wildlife and excellent fishing opportunities? Look no further, Klua Lakes provides all this and more. Klua Lakes Protected Area offers visitors to this remote wilderness an impressive view of escarpments and cuesta topography (ridges with a steep face on one side and a gentle slope on the other). Lush boreal forest surrounds the lakes that provide excellent walleye and northern pike fishing. Moose wade through the shallows and peregrine falcons hunt in the skies above. This area is truly impressive; enjoy a tranquil paddle in the summer or explore it via snowmobile in the winter. Either way, Klua Lakes is sure to leave you with a lasting impression and fond memories of a wilderness experience. 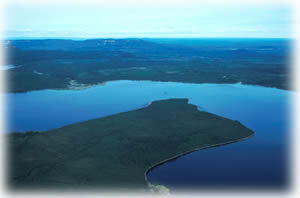 Klua Lakes Protected Area is located east of the Prophet River and east of Mile 240 of the Alaska Highway. There are no designated roads; roads are designed for winter use only. Access is via trails leading up Adsett Creek and via a northern trail from the Alaska Highway. Snowmobile access is sometimes possible due to creek and beaver dam crossings or via float plane. History: The area was identified as a feature of interest in the late 1970’s. A Notation of Interest for future park development was established on June 15, 1984. The 1995 Protected Area Strategy report identified Klua Lakes as an area of interest. The Fort Nelson land and Resource Management Plan in 1997 confirmed the importance of protected status for this area. Cultural Heritage: Klua Lakes Protected Area overlaps with traditional use areas of the Sekani, Slavey, Cree and Beaver cultures of the Prophet River and Fort Nelson First Nations. Conservation: The area provides representation of the Fort Nelson Lowland and Muskwa Plateau ecosections and is characterized by unique flat-topped plateaus with steep, near vertical faces. Klua Lakes occupy a basin scalloped into the sedimentary escarpment; a line of scenic bluffs mark the rim of the basin. These escarpments, located in the Boreal White and Black Spruce Biogeoclimatic Zone, are distinct landscape features and they are dominated by aspen and white spruce stands. The lakes drain eastward over the classic muskeg country of the Fort Nelson Lowlands to the northeast. The cliffs surrounding the lake are used by peregrine falcons, and support a small isolated goat population. Moose, beaver, otter and black bear are common. There is no online management planning information available. This park offers excellent walleye and northern pike fishing. Anyone fishing or angling in British Columbia must have an appropriate licence. Wildlife viewing opportunities with such animals as moose, black bear, grizzly bears, goats and Peregrine falcons. Winter recreation opportunities included snowmobiling and ice fishing. Boil or filter water in the backcountry.